In this construction video tutorial, the eminent engineer Mukesh Shah, provides some step-by-step guidelines to compute unit weight of mild steel angles. It is very important for billing purpose of fabrication work in job site. Now you have to determine the unit weight of 1 meter. Suppose, the angle is divided in two parts i.e. part A and Part B. Horizontal section is taken as A and vertical section is taken as B. 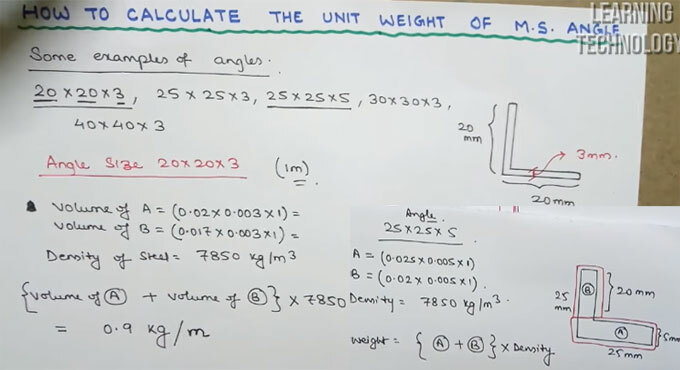 In this way, you can find the unit weight for different sizes of angles. To get more clear ideas, watch the following construction video tutorial.